Billing is a huge part of your teaching business, so before choosing teaching centre software, be sure to do your homework and opt for a system that will accommodate your unique preferences. Teachworks offers flexible billing, allowing you to give your clients different billing options. Our Package Billing Method allows you to bill your clients upfront for a package of lessons or hours that can be used over an undefined period of time. 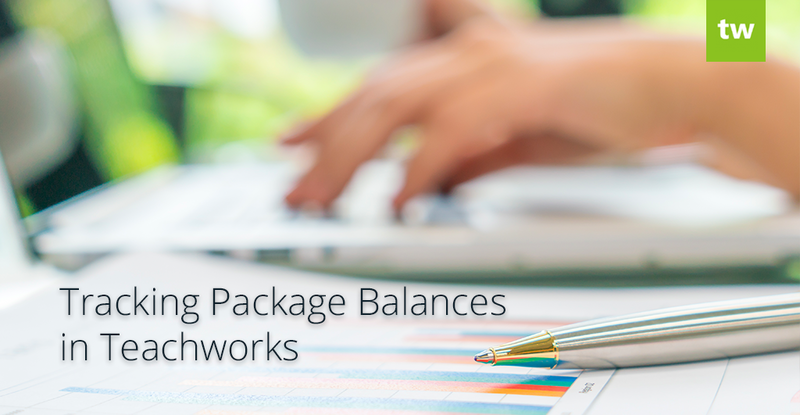 This article will explain in more detail how you can effectively and efficiently track package balances in Teachworks. The most important thing to remember when using the Package Billing method, is that packages reduce based on the number of lessons that exist in the calendar with the same service. In order to keep package balances accurate, you need to ensure that the service that you select on the package invoice is consistent with the service you select when scheduling lessons. If a student previously paid for individual lessons and you assigned a specific service to these lessons, you’ll need to create a separate service exclusively for package lessons if you want to switch them to package billing. If you skip this step, package balances will immediately reduce since lessons with the same service already exist. Under your account settings there are a number of package settings that can be customized based on your business preferences. Packages can be tracked by lesson or by hours. If your lessons are usually longer or shorter than an hour, tracking by Lesson would be a good option. You can count “Missed” lessons as used. The “Used” column in the Package Balances table reflects the number of lessons that have been completed in the calendar and marked as “Attended”. If you’d like to include “Missed” lessons in this count, you can enable this option. You can track packages by family or by student. If you track packages by family, all lessons for all students in the family will be deducted from the package balance. If you track by student, packages can be assigned to child students. Packages can be made available once the invoice has been approved or only once it’s been paid. If you’d like to make packages available as soon as you’ve created and approved the invoice, choose the “Approved” option. If you’d like to make it available only once a client has paid, you can set it to “Paid”. Overages are indicated in red and you can easily sort the columns by clicking on the column title. If for example you want to see all clients who have more scheduled hours/lessons than they’ve purchased, you can sort the “Overscheduled” column to see all the relevant clients at the top of the list. Why are package balances are not reducing when I schedule lessons for the student? In this case, it’s likely that the service on the invoice doesn’t match the service used when lessons are scheduled in the calendar. You can either update the service on the lessons or on the package invoice. If the package invoice has already been paid, you can unallocate the payment, edit the invoice and update the service, and then allocate the payment to the invoice again. Why do package balances fall below 0 before I’ve even scheduled lessons? It’s likely that lessons with the same service has been scheduled for the student in the past. To check if this is the case, you can filter the calendar by service and by student or use the Lesson Summaries Report to generate a report that shows the student’s lessons and the selected service for these lessons. We generally recommend adding a package variation of the service exclusively for package lessons to avoid any confusion. Why is the student’s lesson cost 0? If a student’s billing method is set to “Package”, their lesson costs will automatically be set to 0. With the package billing method, you’re invoicing your clients for a package of lessons as opposed to individual lessons, so to avoid any accidental over-billing, the lesson cost is set to 0 for their lessons. Can I charge a client for individual lessons and package lessons? Absolutely, in this case you’ll need to use 2 separate services — one for lessons that you’ll bill individually and one for package lessons. 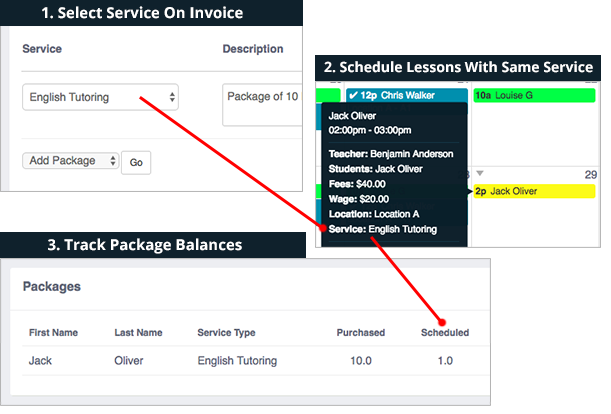 You can set the student’s billing method to “Package” and then you can use our Cost Override feature when adding lessons that you’ll bill for individually. How can I decrease the number of package lessons/hours for a client? Package balances can be reduced by creating credit notes. If you want to use this method, be sure to select the “Credit Package” option on the credit note. Tracking Package balances manually is tedious, can I automate this? Our Package Balance Alerts Add-On allows you to keep track of package balances by sending email alerts to your company (or your clients) when packages drop below a specified level. For more information about our Package Billing Method, visit our Knowledge Base. « Courses and Other New Features!